A joint effort, between the National Office for Electoral Processes (ONPE) and the National Electoral Jury (JNE), allowed the successful New Elections in Metropolitan Lima last November 24th. Collaboration and commitment proved key to making the partial implementation of e-voting possible. Find the review here. The Political Commission of the Consulting Council of the Institute for Mexicans Abroad (CCIME) is urging authorities to acknowledge the right of Mexicans living abroad to vote. The commission is also promoting e-voting as the best mechanism to guarantee a successful vote from outside Mexico. Find more information here. Throughout the course of history, the Venezuelan electorate has paid more attention to national elections than to local ones. This behavior became patent with the elections that took place last December 8th in the South American country to assign 2,792 local positions. 11.3 million voters (out of about 19 million) attended the election, i.e., there was a 58.92% participation rate. This is one of the highest rates registered in this kind of elections, but it pales in comparison to the 80% participation registered for the presidential elections held this same year. 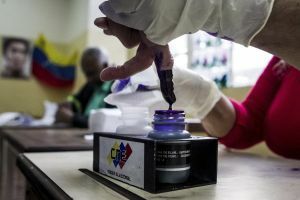 Although the recent municipal elections in Venezuela were technically “complicated” due to the amount of posts to elect (up to 12 in some constituencies), the session was held with no serious drawbacks, according to Tibisay Lucena, president of the country’s National Electoral Council. In fact, the automated voting system, which was subjected to a dozen audits certified by representatives from the political actors participating in the election —as is the tradition—, worked seamlessly and any problems that arose (mainly related to delays in the consolidation of polling stations due to absence of their members) were quickly solved. This was confirmed by the international observers led by the Unasur mission, who highlighted the fact that the elections were carried out normally. Nevertheless, they asked the Venezuelan electoral authorities for a stronger campaign to foster participation in local elections. “The situation in the polling stations was normal, with no alterations or conflicts that might have affected the development of the election,” stated Domingo Paredes, president of Ecuador’s CNE and chief of the Unasur mission. Since 2004, the country has been using technology provided by Smartmatic, which currently allows it to have a 100% automated suffrage: voter authentication through fingerprint, and exercise of suffrage done through touchscreen devices with electronic ballot. The machines can store, count, aggregate, and transmit results in an encrypted way, and it can also print a paper receipt where each voter’s intent is registered. In Venezuela, 2,792 posts were chosen. These are distributed as follows: 335 mayors, 1,680 councilors (chosen by name), 69 indigenous representatives before municipal councils (chosen by name), 686 list-type councilors (chosen by voting for a political party), the Metropolitan Mayor of Caracas, the District Mayor of Alto Apure, and 20 district councilors. The polling stations closed between 6pm and 7pm, and by 10pm CNE had already emitted the first bulletin with the official results, with the names of the elected mayors of the main capital cities in the country and the correlation of the municipal councils won by the two main political forces.